Lenovo has announced a new budget tablet called IdeaPad A1 that is priced as low as $199 (less than Rs 10,000). This will be the third tablet offering from the company after IdeaPad K1 and ThinkPad (for professionals). The new tablet has a 7 inch capacitive multi-touch screen (1024x600 pixel resolution) and it runs on the Android 2.3 Gingerbread (sadly not Honeycomb) operating system. It is powered by a 1GHz ARM Cortex A8 processor and has 8GB of internal memory that is expandable up to 32GB with a SD card. 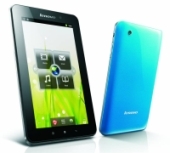 The tablet has two cameras (one front and one rear) and supports the Android Market and Lenovo's app store. It also has Global positioning system (GPS) which will work irrespective of the fact that the user has an internet connection or not. It has Wi-Fi and Bluetooth and comes in Black, white, pink, and blue colour options. It is around 12.7 mm thick and weighs it about 409 grams. The launch date and the exact Indian price of the tablet were not disclosed by the company as of now, but we will see the tablet hit the market in the fourth quarter of this year. The best thing about the tablet is its price. It is even cheaper than the MSI Enjoy series (Rs14,999 and Rs13,999) of tablets and the recently launched Reliance 3G tab (Rs.12,999). Although all the exact specifications are not available as yet, but the information that we have clearly shows that IdeaPad A1 can give the other budget tablets available in India a run for their money.